The global market for drugs that fall under the Breakthrough Therapy Designation (BTD) is forecast to grow from $48.8 billion in 2017 to $99.2 billion by 2022, according to a comprehensive market analysis by BCC Research. In 2012, the US FDA launched the BTD pathway to expedite the approval of drug candidates that are intended to treat serious or life-threatening diseases and that outperform existing therapies. The European Medicines Agency introduced a similar fast-track program, called PRIME (PRIority MEdicines), in March 2016. “Our analysis of the breakthrough drug market shows that companies have an opportunity to leapfrog the lengthy drug approval process by up to three years, generating hundreds of millions of dollars in revenue and maximizing the length of time their drug is on the market before their patent expires,” says Kevin Fitzgerald, BCC Research Editorial Director. BTD is in its infancy. Regulators and sponsors are still learning how to navigate this new pathway. Since its introduction in the United States, 141 drugs have gained BTD and 49 of them have been approved. Oncology therapies comprised the largest share (46.8%) of approved breakthrough therapies and $11 billion of the global breakthrough drug market in 2016, according to BCC Research’s analysis. 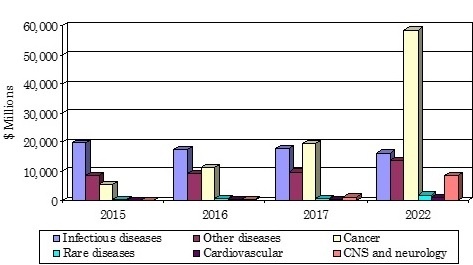 However, companies are becoming increasingly active in pursuing use of this new pathway in other therapeutic areas, including rare diseases (24.1%), infectious diseases (14.2%), CNS and neurological disorders (5.7%), and cardiovascular disease (3.5%). As more companies adapt, BCC Research predicts that pharmaceutical and biotech companies of various sizes will gain footholds in the breakthrough therapy market, with drugs targeting a wider range of diseases. By 2022, BCC Research forecasts that drugs for the treatment of rare diseases will generate $1.6 billion in the global breakthrough therapy market. Therapies for CNS and neurological disorders will generate $8.4 billion, and cancer drugs will account for $58.6 billion of breakthrough therapy sales. Novartis and Kite Pharma are in a neck-and-neck race to get their respective CAR-T (Chimeric Antigen Receptor [CAR]–T cell) therapies to the market. In CAR-T, a patient’s immune cells are extracted and genetically modified to hunt and kill cancer cells before being returned to the body. In July 2014, the US FDA designated Novartis’ CTL019 as a breakthrough therapy for the treatment of pediatric and adult patients with acute lymphoblastic leukemia. In December 2015, Kite Pharma’s KTE-C19 was granted BTD for diffuse large B-cell lymphoma (DLBCL), transformed follicular lymphoma, and primary mediastinal B-cell lymphoma by the US FDA. KTE-C19 has also received PRIME regulatory support for DLBCL in the European Union. Vas Narasimhan, Global Head of Drug Development and Chief Medical Officer at Novartis, told Bloomberg that the US FDA is likely to rule in October on Novartis’ experimental CAR-T therapy, CTL019. The regulatory agency is also expected to make a decision on Kite’s product by the end of November. Novartis’ CTL019 awaits clearance for treatment of acute lymphoblastic leukemia, whereas Kite’s first target is DLBCL, which afflicts a larger group of people. Novartis is also evaluating CTL019 in DLBCL and reported that, in a mid-stage study, the disease was eradicated in more than one-third of patients who received the treatment. CAR-T therapies could command high prices because they are intended as one-time treatments and have shown benefits in some patients who had no other options. Yet some studies indicate that only about one in three people experience a lasting response. Some type of pay-for-performance structure may entice insurers to accept higher price tags, because it means they would be paid back if the treatment failed. Novartis may link the price of its treatment to results in each patient, according to Narasimhan, who told Bloomberg that the company is looking at multiple creative options. It is also using stem cell transplants, which cost as much as $800,000 apiece, as a yardstick. Novartis Chief Executive Officer Joe Jimenez has cited studies done for UK health authorities, showing that the treatments may be cost-effective at roughly $750,000. A study by the United Kingdom’s National Institute for Health and Care Excellence (NICE) found that there is a need for new pricing approaches for medicines that bring uncertainty as well as huge potential benefits. One idea is akin to leasing, with the price of the medicine spread over monthly fees. Novartis has considerable expertise in marketing niche oncology agents and will be in a strong position to optimize its strategy ahead of the competition. On the basis of current clinical data and a launch in late 2017, BCC Research anticipates that CTL019 will generate sales of $473 million by 2022. Kite Pharma’s KTE-C19 has shown promising activity in B-cell malignancies, including chemorefractory DLBCL, and after failure with an allogeneic transplant. Given its comprehensive clinical program and promising data to date, BCC Research anticipates that KTE-C19 will also be approved for use by early 2018. Although it will take time for clinicians to get up to speed with using allogeneic CART therapies, BCC Research anticipates that the use of these products will gradually gain acceptance in the treatment of chemorefractory DLBCL. Kite will need to think carefully about the pricing of its product, particularly given the current environment, as the healthcare system migrates toward risk-sharing agreements in gene therapies. BCC Research predicts that KTE-C19 will generate revenues of $600 million by 2022. Compressed development timelines and expedited launches present significant challenges to all pharma companies developing breakthrough therapies. In some cases, a lack of compelling clinical data may not be sufficient to convince payers/healthcare providers of a drug’s value at the time of launch. Thus, the commercial success of any given product will be highly dependent on the ability of its manufacturer to identify the key value drivers for each therapeutic area in support of pricing and market access activities.